Save $$$ on this kit when compared to the unbundled price! Assembled here for your consideration is this bundled package of our most popular items. Install it on a single wall or spread it throughout your garage. The choice is yours. We provide the pieces and you do the arranging when you orchestrate your own individualized storage solution! Note: Click on any picture or link below for individual product details. For tough environments storeWALL is heavy duty. It's the original, industrial strength PVC wall panel that is waterproof and weather proof. It's perfect for open garage conditions - install it indoors or out. Note: See bottom of page for available color options. (3) Boxes of storeWALL Screws: (100 per box) SC61/SC62 color matched 1-3/4 or 2-1/2 inch bugle head screws needed to mount StoreWALL Panels. Select 1-3/4" screws when securing directly to wall studs or other secure building material. Select 2-1/2" screws when securing to studs underneath drywall or other plaster material. Color Options: (1): Metallic Flake White PVC Laminate Cabinet Facing and Cabinet sides/top in Grey PVC Textured Laminate. Note: Picture is a rendering that does not exactly depict actual cabinet color nor beauty of finish. (2): Graphite Grey with Black sides (not shown). Use to hang Ulti-MATE GA-09SW cabinets off the floor and onto the slotted storeWALL panel system. Allows for easy relocation of cabinets when desired. Store numerous items off the floor. Provides great overhead, perimeter wall storage along the top edge of your wall panel. These two units provide 7.5 of continuous feet of 15 inch deep storage space when placed side by side! Can also be stacked one above the other. Get your stuff off the floor and onto the walls. A great way to keep things organized and easy to find. This heavy duty shelf holds more than 100 lbs. and is the perfect solution for toolboxes, cases of soft drinks, and more. Get your stuff off the floor and onto the walls. A great way to keep things organized and easy to find. Unlimited storage uses for garden items, car supplies, toys, sports gear, etc. Ventilated basket allows air movement, visibility, and keeps harmful items out of reach. Holds all long handles tools in one place. Heavy duty coated wave hooks keep tools secure. Accessory hooks store garden tools, aprons, and other outdoor tools. Heavy duty friction grip locks tools securely in place. Items attach and remove quickly and easily. Ideal for shovels, rakes, sledge hammers, and other long handled tools. Heavy duty construction for big storage problems. Securely holds extension ladders, heavy tools, and other problem items. Coated hooks keep items in place. 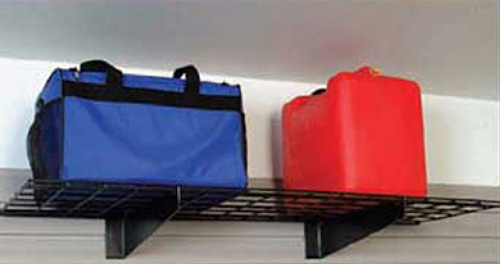 Hang small items off the floor, above your workbench, or anywhere you want them. Keep items easy to find. Note: If you are buying this kit for self installation; Some items ship from different warehouses and will arrive as separate deliveries. StoreWALL panels will arrive by common carrier (large truck) and you may be asked to assist the driver in unloading. Free shipping is included in this special price! Recommended options: Add a roll out or tile flooring product to complete your garage transformation!